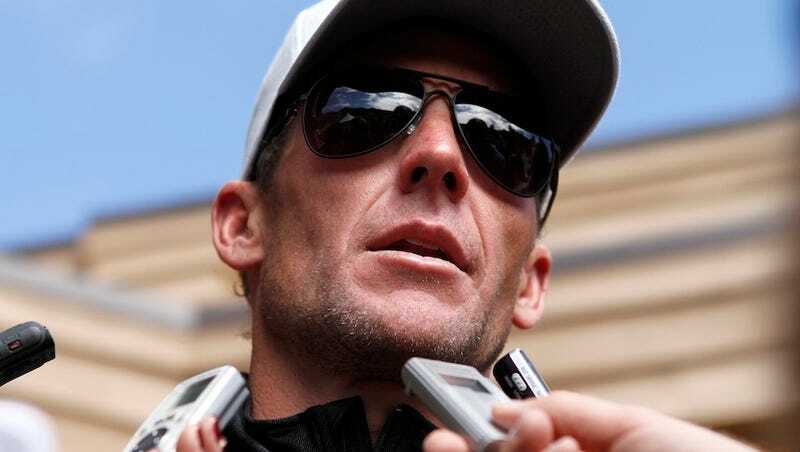 Seven-time Tour de France-winning cyclist Lance Armstrong has dropped his fight against doping charges leveled at him by the US Anti-Doping Agency. This means that he likely will be stripped of each Tour de France title and banned from competitive cycling for life. Specifically, he'll be stripped of all titles and accomplishments going back to August 1, 1998, including a bronze medal at the 2000 Summer Olympics. The decision sets up a likely lifetime ban from the sport and the possibility that Armstrong will be stripped of his signature achievement - the extraordinary run of Tour titles he won from 1999-2005. Armstrong, who retired last year, declined to enter arbitration - his last option - because he said he was weary of fighting accusations that have dogged him for years. He has consistently pointed to the hundreds of drug tests that he has passed as proof of his innocence. "There comes a point in every man's life when he has to say, "Enough is enough." For me, that time is now," Armstrong said in a statement sent to The Associated Press. He called the USADA investigation an "unconstitutional witch hunt." "I have been dealing with claims that I cheated and had an unfair advantage in winning my seven Tours since 1999," he said. "The toll this has taken on my family and my work for our foundation and on me leads me to where I am today - finished with this nonsense." USADA will almost certainly treat Armstrong's decision as an admission of guilt, and hang the label of drug cheat on an athlete who was a hero to thousands for overcoming life-threatening testicular cancer and for his foundation's support for cancer research. AUSTIN, Texas - August 23rd, 2012 - There comes a point in every man's life when he has to say, "Enough is enough." For me, that time is now. I have been dealing with claims that I cheated and had an unfair advantage in winning my seven Tours since 1999. Over the past three years, I have been subjected to a two-year federal criminal investigation followed by Travis Tygart's unconstitutional witch hunt. The toll this has taken on my family, and my work for our foundation and on me leads me to where I am today – finished with this nonsense. I had hoped that a federal court would stop USADA's charade. Although the court was sympathetic to my concerns and recognized the many improprieties and deficiencies in USADA's motives, its conduct, and its process, the court ultimately decided that it could not intervene. If I thought for one moment that by participating in USADA's process, I could confront these allegations in a fair setting and – once and for all – put these charges to rest, I would jump at the chance. But I refuse to participate in a process that is so one-sided and unfair. Regardless of what Travis Tygart says, there is zero physical evidence to support his outlandish and heinous claims. The only physical evidence here is the hundreds of controls I have passed with flying colors. I made myself available around the clock and around the world. In-competition. Out of competition. Blood. Urine. Whatever they asked for I provided. What is the point of all this testing if, in the end, USADA will not stand by it? From the beginning, however, this investigation has not been about learning the truth or cleaning up cycling, but about punishing me at all costs. I am a retired cyclist, yet USADA has lodged charges over 17 years old despite its own 8-year limitation. As respected organizations such as UCI and USA Cycling have made clear, USADA lacks jurisdiction even to bring these charges. The international bodies governing cycling have ordered USADA to stop, have given notice that no one should participate in USADA's improper proceedings, and have made it clear the pronouncements by USADA that it has banned people for life or stripped them of their accomplishments are made without authority. And as many others, including USADA's own arbitrators, have found, there is nothing even remotely fair about its process. USADA has broken the law, turned its back on its own rules, and stiff-armed those who have tried to persuade USADA to honor its obligations. At every turn, USADA has played the role of a bully, threatening everyone in its way and challenging the good faith of anyone who questions its motives or its methods, all at U.S. taxpayers' expense. For the last two months, USADA has endlessly repeated the mantra that there should be a single set of rules, applicable to all, but they have arrogantly refused to practice what they preach. On top of all that, USADA has allegedly made deals with other riders that circumvent their own rules as long as they said I cheated. Many of those riders continue to race today. The bottom line is I played by the rules that were put in place by the UCI, WADA and USADA when I raced. The idea that athletes can be convicted today without positive A and B samples, under the same rules and procedures that apply to athletes with positive tests, perverts the system and creates a process where any begrudged ex-teammate can open a USADA case out of spite or for personal gain or a cheating cyclist can cut a sweetheart deal for themselves. It's an unfair approach, applied selectively, in opposition to all the rules. It's just not right. Today I turn the page. I will no longer address this issue, regardless of the circumstances. I will commit myself to the work I began before ever winning a single Tour de France title: serving people and families affected by cancer, especially those in underserved communities. This October, my Foundation will celebrate 15 years of service to cancer survivors and the milestone of raising nearly $500 million. We have a lot of work to do and I'm looking forward to an end to this pointless distraction. I have a responsibility to all those who have stepped forward to devote their time and energy to the cancer cause. I will not stop fighting for that mission. Going forward, I am going to devote myself to raising my five beautiful (and energetic) kids, fighting cancer, and attempting to be the fittest 40-year old on the planet. "It is a sad day for all of us who love sport and our athletic heroes. This is a heartbreaking example of how the win-at-all-costs culture of sport, if left unchecked, will overtake fair, safe and honest competition, but for clean athletes, it is a reassuring reminder that there is hope for future generations to compete on a level playing field without the use of performance enhancing drugs."